As marketing professionals, it is crucial that we stay on top of new trends inside and outside the industry. But knowing when to get on board with certain trends and when not to is also an important part of marketing success, especially over time. 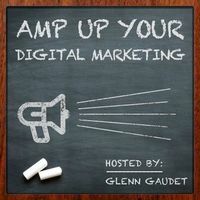 On this week’s episode of AMPUP Your Digital Marketing, host Glenn Gaudet sits down with Ted Page, co-founder of Captains of Industry, a creative marketing consultancy based in Boston. Ted has over 25 years of experience guiding the creation of brands and content marketing campaigns that have helped clients thrive and reinvent their industries. He won a Telly award for “The Institute for Backup Trauma,” starring John Cleese, featured by the Content Marketing Institute as the first successful B2B “viral” campaign. Ted is also the author of the top-ranked eBook, Branding and Marketing for Renewable Energy Companies. Together, Glenn and Ted explore what has worked and what hasn't over his 25 years of industry experience, and more importantly what has remained crucial to any successful marketing campaign despite industry changes. How Ted’s company has survived and thrived through the many technology and market driven changes over two-plus decades. How to get buy-in from a client when you are ahead of the game and presenting ideas outside their comfort zone. Why you need to speak the same language as your client and how to do that. Why you have to meet your customers where they are RIGHT NOW, and how going with older methods of marketing can be risky. How the story you are telling is crucial to your success. Which methods to consider and use to engage people and share your story most effectively. Why you need to create a content road map. Why you need to challenge your own incumbency by asking why you are where you are. You can connect with Ted on Twitter, at @TeddyPage or via email at tpage@captainsofindustry.com.